Sedona, Arizona is one of the most popular attractions for people visiting Arizona who are interested in spectacular scenery. As you drive into Sedona the red rocks rise on the horizon, and you'll be reminded of old western movies that you always thought had fake backdrops! Closer to Phoenix than the Grand Canyon, Sedona makes an easy day trip for gorgeous views, cool hikes, art gallery hopping, shopping, dining, and vortex investigating. One of the easiest ways to get to Sedona is to take a guided tour. That way you can leave the driving to someone else. If you want to leave the shops and cafes and galleries of downtown Sedona to explore the red rocks, we highly recommend a 4x4 or jeep tour. Be aware that it is about 3,000 feet higher in elevation in Phoenix. That means that it will be about 10 F (give or take) cooler in Sedona than in Phoenix. It occasionally snows in winter, and it is hot in summer. Downtown Sedona, where many of the galleries, shops, restaurants and tour companies are located, is from 2 to 3 hours from most locations in Greater Phoenix. It is an easy drive on highways. Once you are about to enter Sedona, be prepared to negotiate a series of roundabouts, designed to keep traffic moving, but at a non-frenzied pace. Take I-17 (Black Canyon Freeway) north to Exit 298/ AZ179 toward Sedona/Oak Creek Canyon. Take Highway 89 into Sedona. 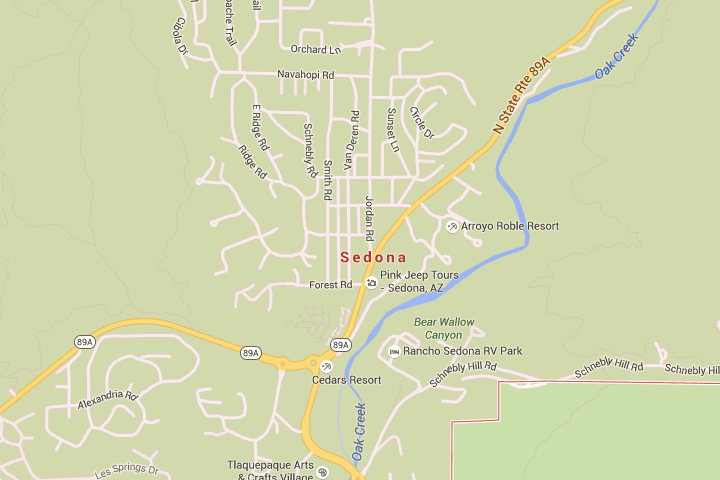 Once you are in Sedona, you'll notice that they have installed many roundabouts. This slows traffic down. That's a good thing because Sedona is often congested not only with cars but with people walking in and crossing streets. Roundabouts also keep traffic moving better than traffic lights (and roundabouts are cheaper than traffic lights). Be aware that Sedona does get winter weather, so leave extra time if you are driving on days when there might be inclement weather. You probably won't need chains or any special equipment for your vehicle, since significant accumulations of snow are rare. To see the image of the map above larger, simply temporarily increase the font size on your screen. If you are using a PC, the keystroke to us is the Ctrl + (the Ctrl key and the plus sign). On a MAC, it's Command+. The Best Way to See Sedona's Red Rocks is in a Jeep!